Cloudy and Cool, Water temperature 67* and Clear. We got out at 6 from High Point and went to catch bait. We caught a tank full and set out a spread of planner boards and a bobber. We caught one before I could get a side of boards out and took a couple of more hits quickly. A few boats went by and fishing slowed considerably after that. We continued to work a shoreline for over a mile with our baits getting chased to the surface but landing only a couple of Stripers. By 11 we had run out of baits so we got our spread in and went to catch bait. It took a while to locate what I wanted but once I did we caught bait in short order. The wind had got up which prevented me going to where I wanted to so I choose an alternative spot and set our spread back out. By now it was noon and I was ready to put some fish in the boat. We started hooking up and for the rest of the afternoon we would boat a fish about once every 10 minutes or so. Today we caught 19 Stripers, a Bass and a few Catfish. Alex is pictured holding the Bass he caught which he released. This is a heavy stringer, you can click on the picture to get a better look at the fish. Picked the guys up at 6 this morning and caught bait. I set up in an area I thought I could catch some nice fish in and pulled boards through it. After an hour we had boated only 1 Striper and had a dozen more hits, swirls and hookups. I thought my bait may be a little too big so I went and caught 40 more smaller baits and set up in a different area. We hadn't gone 40 yards before the same thing started happening. Obviously the fish were off this morning and did not want to eat our offerings. I continued to work flats nearby us catching a fish here and there, no set pattern. We were under the gun this morning because Tim had to come off the water around noon. After a while I wanted to make a move but simply did not have the time or enough bait. We ended up having a good morning, the guys took home a dozen Stripers for the freezer. Sunny and Warm, Water temperature 63* and Clear. Picked the guys up at 6 this morning, caught bait and went fishing. I wasn't really looking forward to fishing today with the first warm weekend and all the boats on the water. All I look for before I set out a spread of Water Bugz Planner boards is an area where there is no boat traffic, it is that simple. Boat motors spook Stripers, if you want to catch fish in the spring get away from other boats or boating lanes. I try to find a bay or area out of the main flow of traffic and fish the area till boats run through it or other Striper fisherman who are clueless come into the area, then I usually leave and find another similar quiet area. It is actually comical to predict when I see a Striper fisherman come down the lake that he will see our boat, slow down and try to either cut us off or fish the area where we are fishing thinking that they are on um now. Stripers are scattered over the whole lake now and will be for the next couple of months. Needless to say I had to hit numerous areas today to avoid boats but everywhere we hit that was quiet we caught fish. Water temperatures have risen 6 to 8 degrees this week and the fish are reacting to the change in a favorable way. Can't wait to get back out on the water during the week for some peace and quiet. What a beautiful weekend! DP took his daughter and his Father Donnie out for an afternoon of catching on the lake today. Donnie has that big smile on his face because he enjoyed watching his granddaughter reel in a lot of these fish. Donnie goes back a long way on Lake Anna, he is one of the original Bass fisherman on the lake who fished and won many a Bass Tournament here. He has forgot more than most people know about the lake. [Anyone his age usually does] Donnie and I go way back also, one beautiful day I threw him out of my Champion Bass boat at 72MPH! Jimmy is holding his 37 pound Catfish that he caught on Thursday evening. It was caught on a Gizzard Shad. 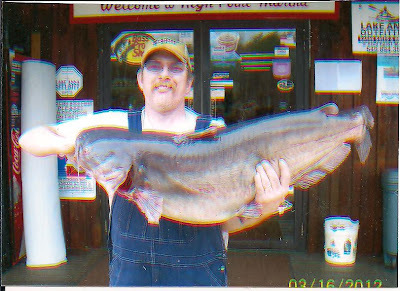 Jimmy caught another Catfish just as big on the lake last April. They broke the net trying to get the fish in the boat. We got started at 7 this morning and headed up lake to catch bait. On my first set up the first fish we caught was a catfish. I told the guys right then that was a bad sign. We fished the area for about an hour just to catch 1 small Striper. I knew the bite was off so I caught some more bait and hit another area. We got a few hits and maybe boated a fish or two but it was the same deal down there also, the fish were simply not feeding. I caught some more bait and hit another area and just couldn't buy a fish. I kept assuring the guys that yesterday it was slow and about 2 the fish went crazy but it was difficult to set there and stare at planner boards. When the moon is bright at night a lot of the time the fish feed so heavily at night they don't feed again for about 8 hours. Next thing we knew we took a hit, boated the fish and did it again and again for the next 2 hours. It was a long day with action sporadic action until we hit the feeding period. The guys hung in there and our patience paid off with a nice stringer of Stripers. Sunny and Pleasant, Water Temperature 52* and clear. This morning I picked the guys up at 6:30 and headed out to catch bait. We caught about 40 nice baits then I found a place with no boats and set out my spread. At least I tried to get out my spread of boards, the fish wanted to eat us before I could get set up. I eventually got out a spread of 13 water Bugz Planner boards and a bobber and worked flats ranging from 20 to 8 feet deep. We did well for about the first hour but the fish turned off so I simply put the boards on the bank out to about 80 yards off the bank and pulled about a 2 mile stretch of water. We finally got low on baits so we caught about 40 more then hit similar areas only to catch a few fish in as many hours. The boat traffic had gotten up with a lot of boats running back and forth enjoying the nice weather. Around 2 I decided to make yet another move so I set out my spread again and just started working the banks. The move payed off, in about an hour of so we proceeded to wear the Stripers out. I had to work hard today with all the action and also the wind to present the baits in a manner to entice the fish to eat. Today the fish would eat when there was no boat traffic and when the boats were around it was slow. Paul contacted me earlier this week to go out on Saturday afternoon for a half day trip so I hooked him up with DP and DP hooked him up with a bunch of Stripers. Here are a few pictures of some of the fish they caught. Anthony took Bryce and his Dad out fishing today and landed this nice 13 pound fish along with some other very nice Stripers. Not a bad way to spend your spring break from college. I picked the guys up at the marina at 6 this morning and headed out to catch bait. I checked a couple of areas and did not see much so I kept looking till I found what I wanted. After making 4 or 5 throws we had over 40 baits so we went fishing. I had no sooner got my spread out when we started hooking up with fish. Within 150 yards we put 6 Stripers in the boat. We worked the bank a little further catching only one fish so I turned around to hit the productive area again. Last night it rained and the water was calm on our first pass but the wind had just started to get up out of the north and shut the fish right down. We fished the area for another hour or more only to catch a couple more fish. I decided to work another area so we headed that direction taking hits on primary points. We fished today till we ran out of baits. It was a fun morning for us, the guys did not expect all of this kind of action and once we started laughing about some of the comical events that were taking place [Dom] we had fun for the rest of the trip. Can't wait to get these guys out again! Partly Cloudy, WINDY and Warm, Water Temperature 50*. Today I picked up my clients at 6am and went to catch bait. Bait was easy this morning, we had enough to pull a few different areas after about 15 minutes of throwing. I knew I was in for some challenges today, the wind was already blowing and within a few hours we had a steady 30 mph winds with higher gusts. I started to set out my spread of boards but I put out my bobber first and before I could engage the reel it hooked up. I had also put out one board and it also got hit before I could engage the reel. Brian reeled the first fish in and we put it in the boat, a great start for the day. I continued to put lines out and attempted to hold the boat true in the wind. This is Brian's second time out with me, he originally contacted me about a month ago with his main goal of learning how to fish the lake like I do, not necessarily catching a lot of fish but primarily learning how to catch bait and all the finer nuances of Striper fishing Lake Anna. In addition to constant questions and answers today I had Brian deploy some of the baits hoping to get him dialed in on using boards. We took hits this morning out in the middle of the lake, not one fish today came off the bank. We also fished different areas all day, never turning around to hit areas where we had numerous hookups. Needless to say boat control was mostly what I was coping with as the day progressed and the wind gusted. We fished till about 1, the wind was just too strong for me to keep my baits in the strike zone. We caught more fish than were on the stringer today, it was so windy that the wind blew the fish off the pole into the water which we could not recover. Sunny and Cold, Water Temperature about 50*. After getting 5 inches of snow yesterday and waking up this morning seeing the thermometer at 19* I knew I was in for some challenges today. I picked the guys up at marina and headed out to catch bait. The weather had moved the bait and broke it up so I had to throw about 50 times to get enough to fish with this morning. I set out a spread of boards and bobbers pulling flats where I had been catching fish lately. By noon we had 6 hits and had only boated 2 fish so I had to make a move. I went and caught more bait and set up in a totally different area working deeper flats with slightly warmer water temperatures and bait nearby. After taking a few hits I realized what the fish wanted and got dialed in on their pattern. Next thing we knew we were catching Stripers. We put 9 more fish in the boat within 2 hours but had lost a dozen more that were hooked up. The fish were only hitting a particular size bait today which I had run out of so I decided to go catch more bait of that size. I found the bait fairly easily this time, caught it and was fishing within 15 minutes. I don't know what happened within that 15 minutes but monkeys must have jumped on all of their backs because for the next hour and a half we hooked up a dozen more times and lost fish after fish, never boating another Striper. We ended up with a nice stringer of fish considering the conditions of the day but all I could think of was the nicer fish we lost this afternoon and what our catch should have been.